European Waterways' eight-passenger Rosa is a former Dutch "clipper" barge completely refitted in 2010. The ship sails two routes. 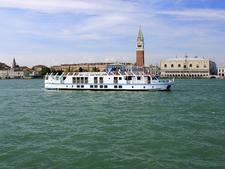 The first is a Gascony cruise that takes passengers through the vineyard-rich L'Occitanie region on the Canal des Deux Mers, the waterway that links the Atlantic to the Mediterranean. The second is a sailing along the 300-year-old Canal du Midi between Carcasonne and Toulouse. The 100-foot barge has four cabins, all of which have en-suite facilities. Two of the cabins have double beds and two have twin beds. The air conditioned interior includes a dining room and saloon. Outside, there's a spacious sun deck with lounge furniture. The ship also carries eight touring bicycles. A four-person crew includes a captain, tour guide, housekeeper and chef.